Warm winters often prevented a successful ice harvest, thus creating ice famines. 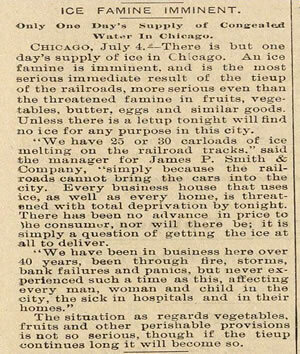 Americans now dependent on a regular supply were scrambling for ice. Due to the unpredictability of natural ice, a decreasing clean water supply and the growing impatience of industrialists, the production of artificial ice began to grow. 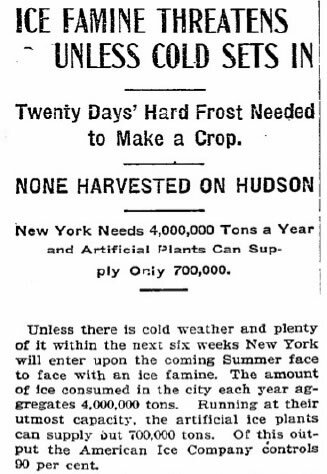 By 1914, 26 million tons of artificial ice was being produced compared to 24 million tons of naturally harvested ice. There was a similar trend around the world making it increasingly unprofitable to export ice from the United States. Concerns grew over the sanitary safety of natural ice from polluted lakes and rivers.